A Philippine Navy vessel grounded over the Second Thomas Shoal since 1999, effectively asserting Manila’s sovereignty over the remote South China Sea reef also claimed by China. This photo was taken on March 29, 2014. By Siddhartha Mahanta, an Assistant Editor at Foreign Policy. This article was first published by Foreign Policy. Tensions are rising in the South China Sea. On May 16, U.S. Secretary of State John Kerry arrives in Beijing for talks which will likely focus on the territorial disputes. But China’s controversial effort to assert its sovereignty in the South China Sea is not only antagonizing its neighbors and the United States: it’s destroying a precious coral reef ecosystem, and the Chinese agency charged with protecting it seems curiously unmoved to stop the damage. Since 2014, Beijing has been engaged in a series of “reclamation” projects in the waters of the South China Sea, expanding islands and constructing landing strips on the coral reefs and rock formations that make up island chains like the contested Spratly Islands. Through this so-called “great wall of sand” operation, Beijing hopes to assert a permanent claim to these specks of rock and coral and, ultimately, the vast majority of the sea itself. And the project is picking up speed. In April, Foreign Policy reported on a set of new satellite images showing that China had built out roughly 3,000 feet of a 10,000 foot runway on the Fiery Cross reef, a part of the Spratlys in the sea’s southern reaches. China’s expansive activities have been met with unease and outright condemnation by some of the other claimant states, including Vietnam and the Philippines, which in January 2013 took its case against China’s claims before an international tribunal under the U.N. Convention for the Law of the Sea (UNCLOS). China asserts that it conducts these activities within the bounds of international law, and for peaceful, defensive purposes. Beijing has declined to participate in the UNCLOS proceedings. It also asserts—correctly—that its neighbors have engaged in reclamation activities that allegedly predate their own. But the sheer scale of its build-out puts it in a league of its own, and exponentially so: China has now reclaimed over 6.6 million square feet of new land, while Vietnam’s projects amount to some 656,188 square feet, according to the latest figures from Washington. All that reclaiming comes at a tremendous ecological cost. The Spratlys host some of Southeast Asia’s most productive coral reefs, with up to 571 different species of coral. These habitats provide a breeding and feeding ground for a staggeringly diverse range of fish. These species, in turn, are essential for the fishing communities of the Philippines. “The dredging and building on coral reefs in the South China Sea is causing irreparable damage to one of the most diverse ecosystems on earth,” says Dr. Alan Freidlander, a biologist at the University of Hawaii and an expert on coral reef ecology. The destructive dredging involved in China’s land reclamation obliterates these reefs, leaving sterile sand and concrete in their place. The actual construction process also destroys areas surrounding the reefs, writes University of the Philippines Institute for Maritime Affairs and Law of the Sea Director Jay L. Batongbacal. So far, an estimated 311 hectares of reefs in the region have been lost, which will result in an estimated $110 million of annual economic losses for the Philippines. On May 11, Foreign Policy joined a group of 15 journalists traveling in Asia with the East-West Center to report on the disputes in the South China Sea, on a visit to the State Oceanic Administration (SOA) in Beijing, which manages China’s maritime affairs and environmental protection policies. Sitting at the front of a long conference room furnished with easy chairs and a plush rug, the Director General of SOA’s Department of International Cooperation, Zhang Haiwen, discussed the agency’s broad mandate, which includes establishing China’s exclusive economic zones, safeguarding its maritime interests, and mapping out a sustainable plan for the development of China’s booming marine economy. Zhang said that China’s “ultimate goal” in the South China Sea “is to achieve the sustainable development of the marine economy.” But SOA’s stance on the ecologically destructive construction in the South China Sea appears to contradict its environmental responsibilities. Zhang spoke repeatedly about SOA’s plan to protect and restore the reefs and preserve the overall ecosystem of the South China Sea, while refusing to directly address questions about the clear contradiction that China’s land reclamation is destroying that very ecosystem that SOA theoretically exists to protect. 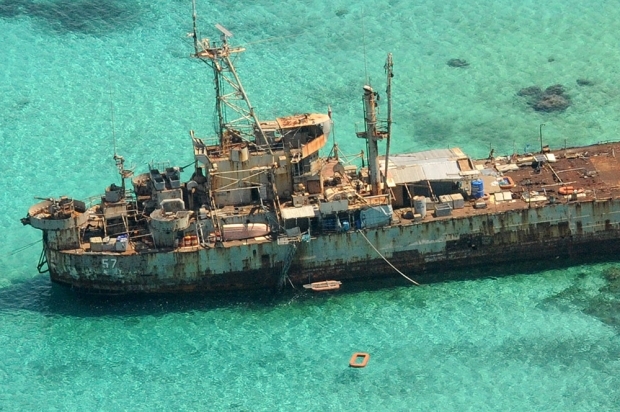 Zhang also made it clear that China has every right to continue its reclamation activities, no matter how disputed they are or how much damage they do to the sea’s delicate reef architecture. In fact, SOA insisted that it had undertaken extensive environmental monitoring and management of these activities. Reclamation, Zhang insisted, follows a very specific process that is “closely reviewed” and subject to “strict observation” by SOA. That claim seems difficult to believe. In 2012, a team of Chinese scientists found that coral abundance in the South China Sea along the Chinese coast had shrunk by some 80 percent over the past 30 years. Further south, the amount of coral covering a group of atolls and archipelagos claimed by six different countries decreased from an average of over 60 percent cover to 20 percent in the previous 10-15 years, due to coastal development, pollution, and unsustainable fishing practices, according to those scientists. Politics aside, one thing is indisputable: China’s hunger to assert its sovereignty in the South China Sea will have enormous, potentially irreversible natural costs.